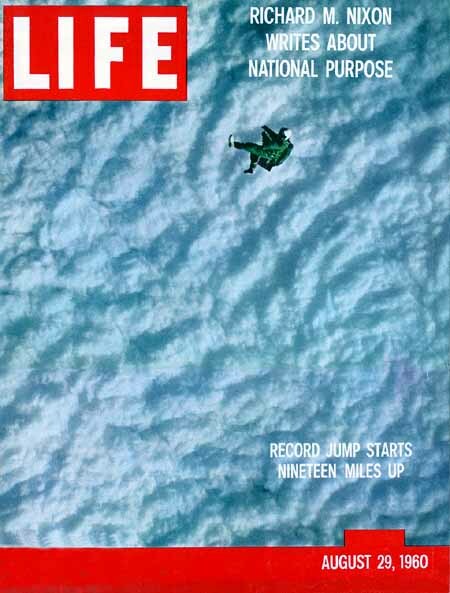 The following passages are excerpts from "The Long, Lonely Leap" by Captain Joseph W. Kittinger Jr. USAF as they appeared in National Geographic magazine. It is the story of his record-setting, high altitude parachute jump from a helium balloon over New Mexico on 16 August 1960. An hour and thirty-one minutes after launch, my pressure altimeter halts at 103,300 feet. At ground control the radar altimeters also have stopped on readings of 102,800 feet, the figure that we later agree upon as the more reliable. It is 7 o'clock in the morning, and I have reached float altitude. At zero count I step into space. No wind whistles or billows my clothing. I have absolutely no sensation of the increasing speed with which I fall. Though my stabilization chute opens at 96,000 feet, I accelerate for 6,000 feet more before hitting a peak of 614 miles an hour, nine-tenths the speed of sound at my altitude. An Air Force camera on the gondola took this photograph when the cotton clouds still lay 80,000 feet below. At 21,000 feet they rushed up so chillingly that I had to remind myself they were vapor and not solid. For most skydivers, the acceleration experienced while falling is not constant. As a skydiver's speed increases, so too does the aerodynamic drag until their speed levels out at a typical terminal velocity of 55 m/s (120 mph). Air resistance is not negligible in such circumstances. The story of Captain Kittinger is an exceptional one, however. At the float altitude where his dive began, the Earth's atmosphere has only 1.5% of its density at sea level. It is effectively a vacuum and offers no resistance to a person falling from rest. The acceleration due to gravity is often said to be constant, with a value of 9.8 m/s2. Over the entire surface of the Earth up to an altitude of 18 km, this is the value accurate to two significant digits. In actuality, this "constant" varies from 9.81 m/s2 at sea level to 9.75 m/s2 at 18 km. At the altitude of Captain Kittinger's dive, the acceleration due to gravity was closer to 9.72 m/s2. It's now just a matter of choosing the correct formula and plugging in the numbers. This result is amazingly close to the value recorded in Kittinger's report. As one would expect the actual value is slightly less than the theoretical value. This agrees with the notion of a small but still non-zero amount of drag. This number is another world record — the fastest speed attained by a human without the use of an engine. just after it left the floor on the way up. The first half of this problem is much like every other falling body problem. Things fall and speed up on the way down, so acceleration is positive. The second half of this problem is similar to the first half, only the velocity reduces to zero instead of starting at zero. This means the acceleration should probably be negative. There is another way to solve the second half of this question using the notion of proportionality. 0.67 m is approximately ⅔ of 1.00 m. Velocity is proportional to the square root of distance when acceleration is constant (and the initial velocity is zero). This method is no easier, but it serves as a check on our first calculation. Since both results are identical, we've probably done this right. This question is designed to see if you've been paying attention. The acceleration of a freely falling body is 9.8 m/s2 down near the surface of the Earth. There is little work to do here. Just write the answer. The acceleration due to gravity is still 9.8 m/s2 down even if the basketball is rising. This is a problem in which close attention to signs is a must. Let's assume that up is positive. Start with the givens and the unknown. Pick an appropriate equation and substitute. We have a quadratic here, so we reach for the quadratic equation. You'll excuse me if I drop the units for a moment. We need to see the numbers clearly. Quadratics have two solutions. What do they mean? Surely the negative solution is nonsense. How could a diver dive and yet strike the water before she left the board? The answer is 1.5 s.
Select a good equation and substitute. This is the height above the board. To get the height above the water, add the height of the board. Solving for the impact velocity is perhaps the easiest problem. Just get the direction right. Sketch the following graphs of motion for an object thrown straight up. The displacement-time graph is the easiest for most people to think about. The object goes up for a while and then comes down. Since the velocity is changing, the graph is curved. Looking at the slope of the tangent to the curve, we can see that the object starts with a positive (upward) velocity that decreases to zero at the top where the graph turns around. The slope then turns negative and gets steeper as the velocity increases downward. The velocity-time graph is trickier since many people can't separate it mentally from the previous graph. Using the slope of the tangent of the displacement-time graph can help us. The object's velocity starts out large and positive, decreases at a uniform rate until it reaches zero, then keeps decreasing (or gets more negative, whichever you prefer). At the end, the object is moving downward just as fast as it was moving upward at the beginning. The acceleration due to gravity is constant and directed downward. It neither increases, nor decreases, nor changes in any significant way. Looking at the previous graph, this should be apparent. The velocity of an object grows in the negative (downward) direction at a constant rate. When a value is constant, its graph with respect to time is a horizontal line.